In legacy MVPN scenarios there will be a GRE encapsulated MDT tunnel is created among the PEs and the entire customer multicast traffic of a particular VPN will be encapsulated with the MDT group address and tunneled it. 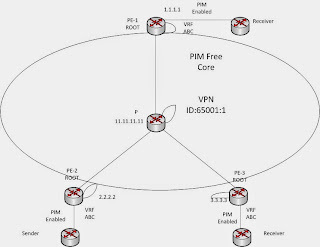 In MLDP scenario there won't be any PIM configured in the core and the multicast packets are MPLS encapsulated. This makes the core PIM free. In MLDP cases there will be a VPN-ID used instead of MDT default multicast group address. The default MDT will be created using MP2MP LSP to support low bandwidth and control traffics between the VRFs. The data MDT will be created using P2MP LSP to support high bandwidth traffic from a particular source. There will be PIM neighbor relationships between the VRFs which are seen in LSP-VIF. 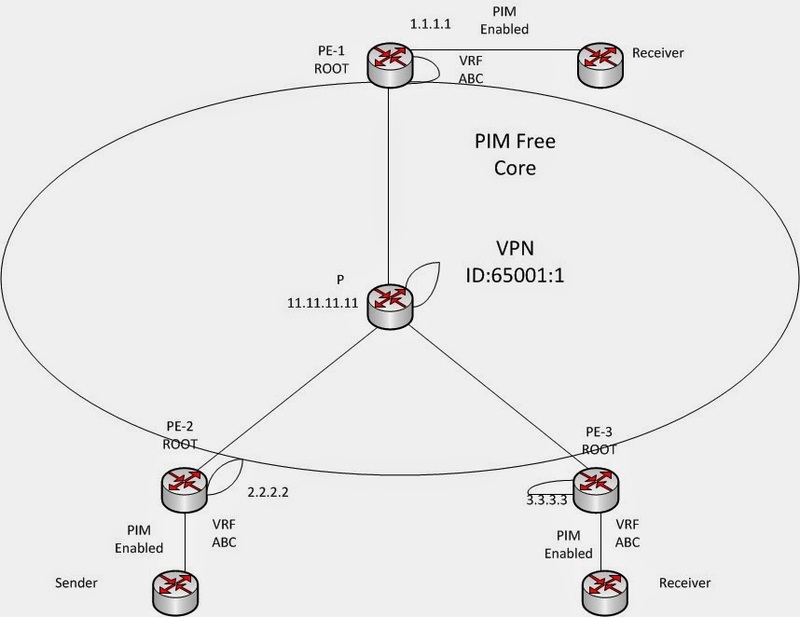 At the edge towards the customer (CE) PIM multicast routing will be enabled for that VRF. The Default MDT will be created using MP2MP LSP. Static root has to be defined for MP2MP LSP. Normally two roots will be configured for redundancy. MDT will use LSP-VIF to transmit VPN multicast packets, i.e., PIM will run over MP2MP LSP. In below depicted figure there will be a MP2MP LSP created with the root at PE1. The opaque value for MVPN is in the format of (VPN-ID). Both MP2MP upstream and downstream LSP will be formed and the labels will be exchanged for the data transfer.